I got this photo in the mail earlier today. It was taken in 1947, but other than that, I don’t have much to go on as far as identifying the location goes. The photographer just missed name of the diner on the sign, and there is just too much film grain to be able to read any of the menu board inside. 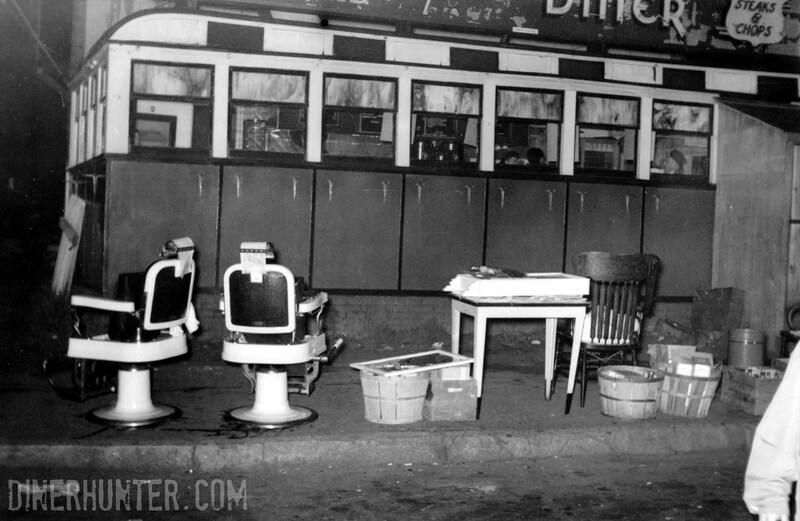 A nearby barbershop must have been moving or have been evicted, with all of its equipment sitting on the street in front of the diner at night. The vestibule is a crude affair, and the flowerboxes are gone. The sign is showing clear signs of age. This entry was posted in Diners / roadside related, Diners/ restaurants and tagged 1930s, 1940s, 1947, black and white, diner, New York, photograph, Ward and Dickinson by Spencer Stewart. Bookmark the permalink.